Do you play an instrument, and even want to compose your own melodies? Nota Musica will be a great help to realize your dreams. Nota Musica edits and arranges your notes: It creates scores, transposes, etc... Nota Musica allows you to play your tunes. 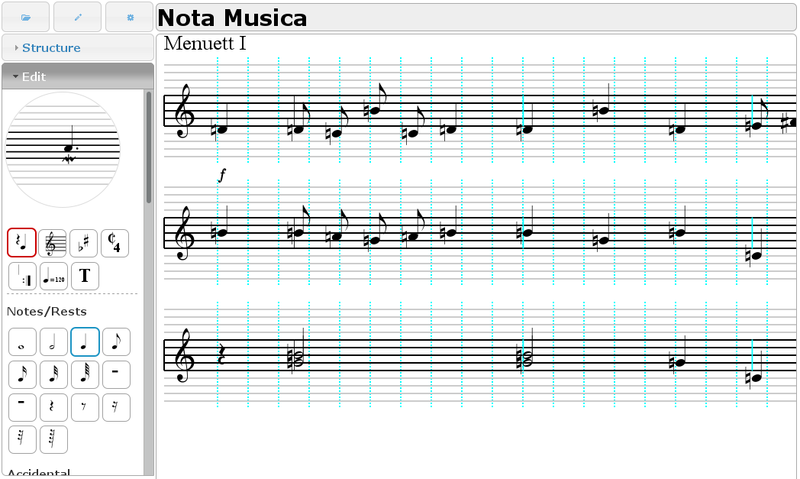 Nota Musica prints your scores in a clear and harmonic manner. Does this sound utopian? Don't panic! Nota Musica is easy to use. It's child's play. Nota Musica was a native OS/2 program. At the moment it is developed to be a web application. The following picture shows a screen shot of the new web application.